Only patrons 16 years of age or older are eligible to use the gym. For safety reasons, children are NOT permitted in this area. Everyone must consult with an instructor before using any of the gym equipment. Complete your Health Status Questionnaire and consult with an instructor before beginning a Fitness Programme. Proper attire, including supportive footwear, must be worn while training in the gym. To be considerate to fellow Members, and in the interest of hygiene, please carry a towel while training, and wipe down each machine after use . If you are feeling unwell or taking medication, DO NOT TRAIN, consult your G.P. At the sign of any chest pain or pressure, faintness or irregular heartbeat while exercising – Stop – and consult your instructor and a G.P. If in doubt about any aspect of your training, do not hesitate to consult an instructor. They are here to help! The gym must be vacated 15 minutes before closing time to allow sufficient time for showering. Please replace weights after use but please do not use hand weights on the Cardio Equipment. 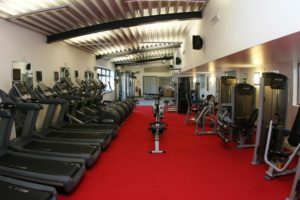 For your comfort and the comfort of others using the facilities you are advised that the use of mobile phones, cameras, camcorders or any other recording equipment are strictly prohibited throughout the environs of the the leisure centre at all times. Your co-operation on this is greatly appreciated.